I first went to the women’s center many years ago to check it out. I then returned 1 1/2 years ago seeking support for many difficult life issues. I felt safe, relaxed, not judged and at peace. It has been a place to seek support without a cost. They validate me. There is no other place for me to go for this kind of support. There is not any other services that allow women to come together and share their lives and to learn coping skills while having fun. I can not afford doing these activities in the community because of the cost. There is also a safety in the fact that the Wisdom Center is chemically free and is for women only. I trusted the environment and did not need to worry about the pressures of dealing with men. I was introduced to the center in what I deem one of the lowest points of my life, and I truly feel that they, and the center, were my saving grace. My abusive marriage had gotten to the point where the police had finally been called, resulting in my wrongful arrest, and my husband being removed from my home. I was left with two children, not enough income to pay even my rent, no friends, and nowhere to turn. I was determined not to reconcile with my husband, beaten and broken, both in body and spirit, when someone pointed me toward the Wisdom’s Center. They listened and soothed my spiritual and emotional aches and pains. They pointed me in directions to aid me with my rent and legal issues -churches, AWAP, Pine Tree Legal. They suggested outlets to assist me in reintegrating back into society. They gave me a place to cry, where I was safe to do so, something I had not had for a very long time. I love those women with all my heart. On many days, when I just felt I couldn’t do it anymore, their doorstep is where I always ended up, because I knew that there were women there that understood, accepted and cared about me and what I was going through. And in this society, where women seem to be pitted against each other so often, a place where women can freely care about each other without constraint is such a rare and beautiful thing. It was about 2 years ago that I started going to the women’s center. I wasn’t sure if this was a good thing or a bad thing. It was suggested to me. Well I tried it. I needed to get away from my prison which was my home. I went down and I loved it, I still do. The ladies are awesome people. This is so awesome. I was afraid of not being accepted and that was wrong. This has allowed me not feel like a prisoner in my own home. Now three years later, I am still going the to Wisdom Center and I still love it. Please come and join us and see what you think. God Bless Everyone. Thank you. For many years I was a client of Tri-County Mental Health Services where I participated in several, interesting activities. Then the state cut the funding and they all stopped. It felt devastating. For a long time I felt lost and lonely and yearned for a way to fill the empty space in my life. Then one day I saw an ad in the paper for the Wisdom Center and decided to check it out. From the moment I walked in I felt welcomed and at home. They listen patiently when I have a problem I need to talk about and sometimes offer helpful advice. They center provides a variety of activities that enrich the lives of all of us who go there… There is an art class that allows its members to show what the world looks like through their eyes. Sometimes a person comes in who talks about subjects such as handling our finances, how to safely take medicines, how to deal with losses and disappointment and other subjects to numerous to mention. For many of us, coming to the Wisdom Center gives us a sense of camaraderie and a feeling of belonging somewhere. It gives us a way to connect with others in a calm, friendly atmosphere where a woman is free to be herself. The Center is like home to me because its a place I can go and relax and talk to other women about support and the help I need. I’ve made many friends there . Where else are we going to go during the day to do things like when people need help like people with mental illnesses or drug addiction or when alcohol abuse for recovering. People are homeless and need somewhere to go that they can hang out and be themselves without walking on eggshells (technically). I’ve been working here for 3 1/2 years, being alive. I feel like part of the furniture, as it goes. It has given me reason to get up every day. I don’t feel useless anymore. I’ve grown every day more and more. Especially for people who feel lost with a closed door. God willing, we will be here to stay. All seems so silly to me now that I was afraid to cross over the threshold. But alas… I am glad I did. I walked through the gateway into a nest of swans. Strange to me that I would have such a feeling. The swan represents so much to me. Among other things the swan is very protective and strong. Beautiful the swan is… but with great strength in its wings. And they know how to use them…not only for protection, but for wrapping around with love. I found this at the Center… swans that spread their wings around me. Very encouraging . I was at a very low place in my life. I had just come out of the “Women’s Shelter” from being abused. I had lost all faith in God, my self esteem was very low. Being so depressed, I didn’t know what to do. I was thinking of suicide. Then, someone mentioned the “Wisdom Center”. That was 7 years ago. When I walked through the door, I knew there was something here for me. They welcomed me with open arms, and I started to feel better. The Center is such a warm, nurturing place. And, I don’t know where I’d be right now if it wasn’t for all the wonderful women that come here. The first time I came to the Center I didn’t know anybody but Klara. I had met her just once, but I needed to put in volunteer hours as part of my school’s requirements. I agreed to sit at the desk and greet women coming in. I was lucky that first day because Lesley was there and greeted me like an old friend. She was so cheerful and she introduced me to a few of the women who were already here “l’ll never be able to remember all of these names,” I thought. But after a time I got to know so many great women, and pretty soon I knew lots of names. Now being at the Center is the high point of my week. DHHS got in my life so I had to choose to go to a Mother’s Group Home or lose my son to the state. So I choose to go to the group home and to go though the steps. For me to get through the steps was to do school, work, or volunteer. I choose to volunteer at the women’s center. They are a big part of my life When I am having a hard time I can come in and talk about what I am feeling, play games etc. The Wisdom Center has done so much for me in the short time I have been going there. In the past, I would spend most of my time in front of the TV or computer. Now, I am having a great time with writing stories and am now speaking up and reading my stories out loud. Also, I am learning a lot about fibromyalgia and how to live with it. I love the socialization that I get from the other women in the class and group. I love that the WisdomCenter has so many programs geared towards women. I have found that since coming to the WisdomCenter, I have more self-esteem and a more positive outlook on life in general. I am so glad that my case manager brought me in here. I should have come in sooner. The Wisdom Women’s Center is an amazing place. I love so much being able to start my day with a meditation. The women that work at this amazing place are so patient and caring. This is certainly a little pot of gold tucked so unsuspectingly in Lewiston. LOVE THIS PLACE! The Center is so heartfelt and charitable, I felt so welcomed and at home. I recommend any women to go there for help with not only hygiene items, but also for healing of the mind, heart and soul. Thank you all for all you do. I needed a place where I could go to be useful and helpful. Just recently becoming disabled and no longer able to work seriously hurt my feelings, not just my body. The Center is the perfect place to give my efforts, such as they are, where I can see (and feel) them improve the quality of life of others, thereby improving my own quality of life. The Center means so much to me because it’s a quiet setting where women can come together and find peace of mind. Also gathering to share ideas such as cooking, cleaning, and relieving stress by writing on whatever is on our minds. It’s also a great place for me with volunteering through Aspire by being able to meet new people and share ideas. The Center for Wisdom’s Women has been a very helpful resource for me with its friendly, peaceful and educational environment. It is a place where I have met wonderful people and have gained wisdom through compassionate interaction. This center has brought me out and into the world. I come for the writing program. The people and are so, so kind, encouraging and helpful. It is so, so nice to be here and out of harm’s way. I feel safe here. I thank God for the Wisdom Center and I don’t know what I’d do without it. I come from So. Paris, ME. Women are mothers , partners and friends. Workers, caretakers , and so much more. Healthy happy strong women are good for families and good for communities and good for society. Good for the world. Wisdom’s Center cares for women. Please support them!! 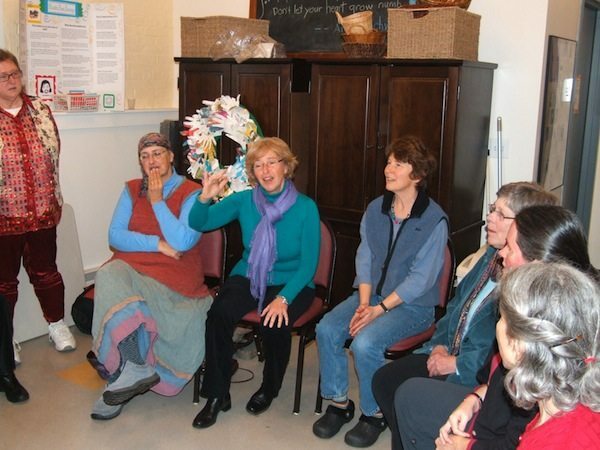 The Center for Wisdom’s Women is one of a kind service/program in area for women. It is a loosely based spiritual support that is never imposing or demanding of the women served/empowered/embraced. All who encounter have found individual and group support/empowerment through chats, activities, and/or group information/support sessions. It is a safe, honest, drop in center for local women.